British Prime Minister Theresa May used her speech in Philadelphia to needle the new Trump administration on a number of issues ranging from globalism to climate change, Islam, and even to defending the European Union. Mrs. May began her speech at the Republican Retreat in Philadelphia with a brief history of Anglo-American relations, invoking the spirit of the Founding Fathers of the U.S. as well as expressing gratitude towards America’s involvement in the World Wars of the 20th century. But her speech was also littered with politically correct terms, as well as left and centre-left talking points regarding international institutions, Islam, and radical Islamic terrorism, the latter of which she called “Islamist extremism”. The British premier compared “open, liberal and democratic” societies in the West versus “closed, coercive” ones. She hailed the United Nations, praised the World Bank, and called NATO “the cornerstone” of Western defence. And Mrs. May also spoke of the necessity for multilateralism in stark contrast with the line pushed by the White House — which prefers bilateralism — over recent days. She cited the need to tackle “climate change” as one of the reasons to back globalist institutions. She called for the two nations to be “internationalist” and “global”, though noted “Some of these organisations are in need of reform and renewal”. And while committing to the destruction of the Islamic State, she failed to mention the name of the group, choosing instead the term “Daesh” — a word preferred by politically correct types and most notably popularised by former Secretary of State John Kerry and President Barack Obama. She went on to describe “radical Islamists”, stopping short of echoing the phrases used by the new U.S. administration including “radical Islamic terrorism”. The British PM stated: “Of course we should always be careful to distinguish between this extreme and hateful ideology and the peaceful religion of Islam, and the hundreds of millions of its adherents, including millions of our own citizens, and those further afield who are so often the first victims of this ideology’s terror”. And while Mrs. May hailed the founding principle of “liberty” and claimed the title of “conservative” to draw parallels between her beliefs and those of Republican attendees, she is perhaps best known in the United Kingdom for an unprecedented expansion of the surveillance state and indeed mass migration at historic levels. Mrs. May was a Remain campaigner during the Brexit referendum, and also used her speech in Philadelphia to underscore her commitment to Britain’s foreign aid spending. And while the British government voted against the State of Israel in the now infamous UN Security Council vote in December, she stated that democratic allies like the Jewish state must be protected. 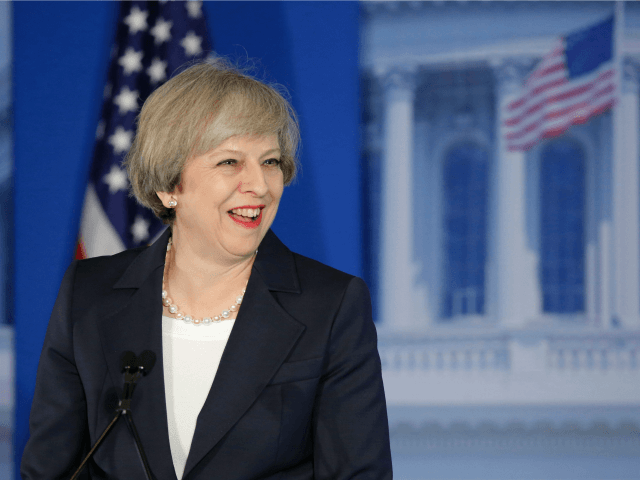 Mrs. May spoke of verification and “policing” of the Iranian nuclear deal and spoke of the trading relationship between the United Kingdom and United States. Curiously, despite Britain’s Brexit vote, Mrs. May said of the European Union: “We will build a new partnership with our friends in Europe. We are not turning our back on them, or on the interests and the values that we share. It remains overwhelmingly in our interests – and in those of the wider world – that the EU should succeed”.